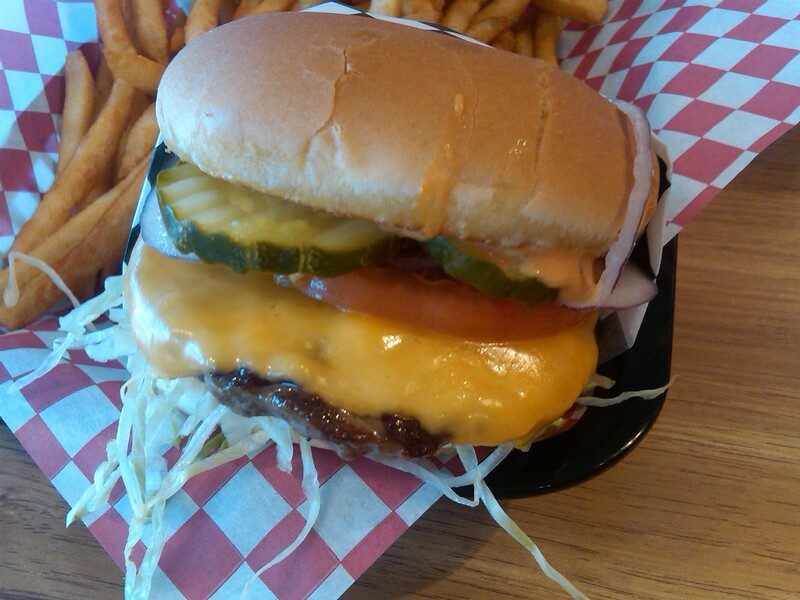 That's right, another burger post. 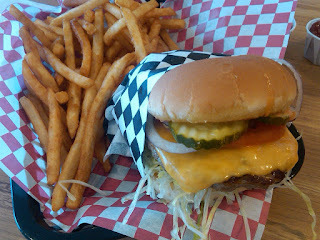 Ever since the I've hosted the Burger Quest and because of my pregnancy, I have been craving a lot of burgers lately. I absolutely love red meat. Since I had to omit steaks from my diet (my meat needs to be cooked medium well to well done), the closest easy thing to satisfying my red meat fix is a really good hamburger. 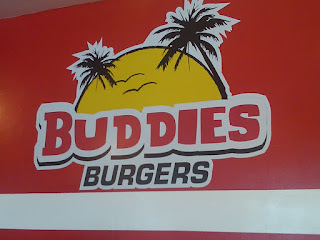 Buddie's Burgers had opened in the College Area where there used to be a bagel sandwich place, then a torta place, then a Mexican food restaurant, and now a burger joint. I hope this place will do well -- and by the looks of the crowd that was there when we visited, I have a feeling that this burger joint will certainly stick around. My friend, Lorena, and I met here for lunch right a few weeks before she left for maternity leave. Our pregnancies are a month apart and we wanted to meet up to chat it up with good food before officially leaving. We have both never been to Buddie's so we were both excited to try it out. Buddie's has a walk-up counter to order and the ladies bring the food right to you. Unfortunately, Buddie's does not have their website up yet, so I could not browse the menu to see exactly what I wanted. I knew, though, that I was there for a cheeseburger and fries. Buddie Burger, Fries, and a Soda for $5.95... oh yeah! I ordered a burger with everything on it (lettuce, tomato, fresh red onion, sauce) with cheddar cheese (for an extra charge.... like $0.30 or something) along with the fries and a cup to fill at the soda fountain (Coke products). Our cheeseburgers and fries arrived pretty fast for "made to order" burgers - less than 10 minutes. It was hot and fresh and brought straight to us at the table. I took the first bite of the burger with everything on it. It was amazingly delicious. The meat was juicy and all the veggies in the burger were so fresh and crisp. I absolutely loved every bite of this burger. I also liked the way they shredded their lettuce. Thin and crunchy, like cole slaw! 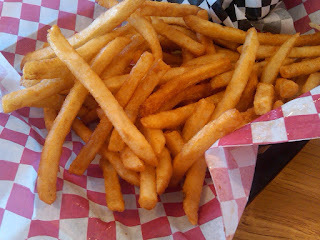 I heard that Buddie's has two kinds of french fries - regular and beer battered. I believe I ordered the Buddies fries, which are beer battered (what?) and they were equally as delicious and amazing like the burger was. None of these fries, I repeat, none of them... were soggy. They were all fried to crispy perfection. I admit that I ate the whole basket of fries alone, not leaving one piece of fried potato goodness behind. I have been there three times already. I cannot wait to try other menu items like the hot pastrami sandwich and the grilled chicken sandwich... that is, if I can be strayed away from their burgers. You sold me.. that looks tasty! The burger looks great! My bf lives really close to the college area so I'll probably check it out. Hopefully I'll go when they're having one of those cheap specials. Hola, Mary! I believe everyday the burger, fries & drink combo is $6.95, except during the days/times that I mentioned when it is $5.95. Pretty good deal for a pretty darn yummy burger! Hope you get to check it out! Onion rings are delicious too! I totally wish I lived near you so I could try that burger. I love a great hamburger. I actually make all different kinds of burgers at home. I don’t know if you have ever had it, but I eat grass fed beef and it makes for an amazing burger. Grass fed beef is lower in calories and fat, higher in omega 3 fatty acids and beta-carotene, and has 4 times more vitamin e than traditional grain fed beef. It would definitely benefit your heath especially while you are pregnant. I get all my grass fed, montana beef from La Cense Beef. I have been ordering from them for a while and have always been completely satisfied. If you are interested check out their website as they have lots of great information on grass fed beef. Hi Kara! Thank you for the visit! There are places in SD that serve grass fed beef burgers, including Burger Lounge and O'Brothers, and I do notice the difference. Thanks for the information about La Cense! I will definitely check it out! 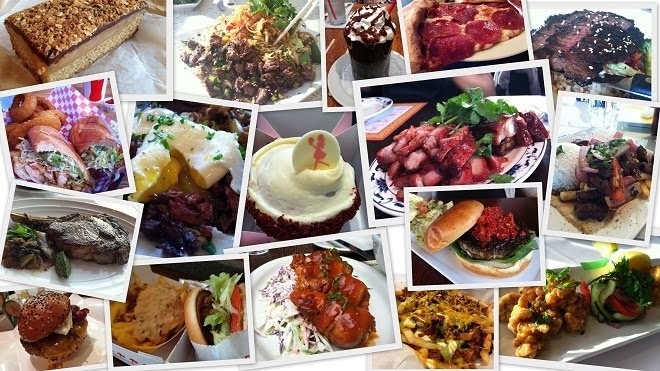 Just scrolled through your RSS feed and wanted to relive the deliciousness of Buddies. Hopefully, we can hit this place up when you're back from maternity leave later this fall. Hope all is well with the baby, mamacita! Hey Lorena! We definitely need to hit up Buddie's again! Funny because I crave Chipotle and coffee from Peabody's now that I am away from work. I will see you real soon - may visit with baby J next month!